Mitochondria are symbiotic intracellular organelles with a variety of functions that are vital for neurons. They “fuel” neuronal metabolism by generating ATP, ensure neuroprotection under traumatic conditions by taking up excessive calcium, and ultimately can trigger apoptosis by opening their “megapore” and releasing the stored calcium and cytochrome c.
Mitochondrial function is tightly linked to their morphology: healthy, charged and neuroprotective mitochondria are fused together and appear as long tubular network; in contrast, damaged, calcium-overloaded, and “neurotoxic” mitochodria are fragmented and have an appearance of dissociated vesicular structures. By imaging individual mitochondria in vivo using transgenic “reporter” mice and two-photon microscopy, we quantify changes in mitochondrial morphology over the time course of minutes to weeks. Using a variety of injury models (from single-vessel thrombosis to traumatic brain injury to cardiac arrest), we have found that mitochondria react to injury rapidly and reversibly in a manner that is sensitive to neuro- and mito-protective drugs such as Cyclosporine A.
Kislin M, Sword J, Fomitcheva IV, Croom D, Pryazhnikov E, Lihavainen E, Toptunov D, Rauvala H, Ribeiro AS, Khiroug L, Kirov SA. 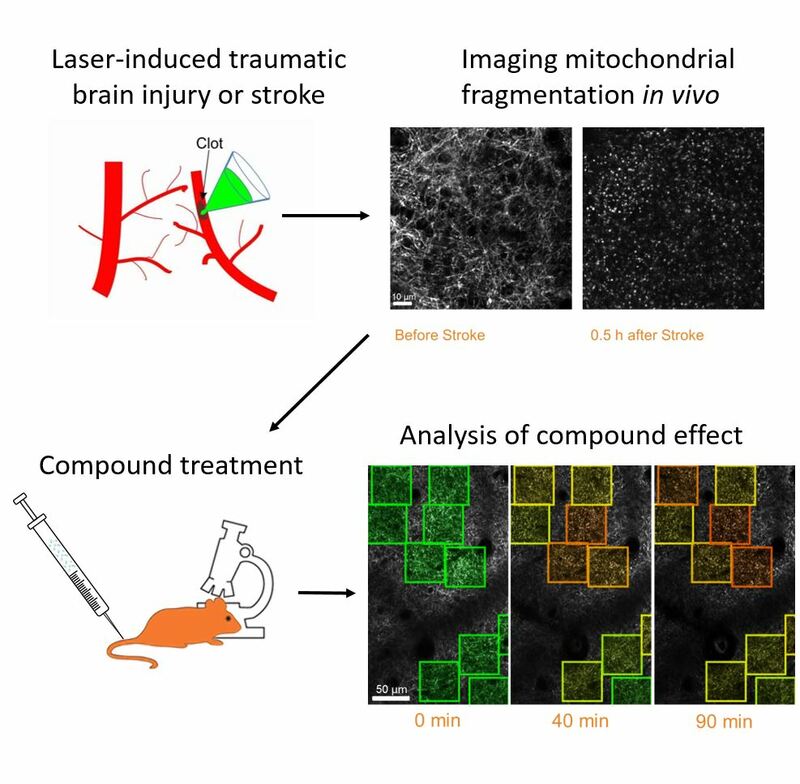 (2017) Reversible Disruption of Neuronal Mitochondria by Ischemic and Traumatic Injury Revealed by Quantitative Two-Photon Imaging in the Neocortex of Anesthetized Mice. J Neurosci 11;37(2):333-348. doi: 10.1523/JNEUROSCI.1510-16.2016. Lihavainen E, Kislin M, Toptunov D, Khiroug L, Ribeiro AS. (2015) Automatic quantification of mitochondrial fragmentation from two-photon microscope images of mouse brain tissue. J Microsc. 260(3):338-51. doi: 10.1111/jmi.12301. Liu RR1, Murphy TH. (2009) Reversible cyclosporin A-sensitive mitochondrial depolarization occurs within minutes of stroke onset in mouse somatosensory cortex in vivo: a two-photon imaging study. J Biol Chem. 284(52):36109-17. doi: 10.1074/jbc.M109.055301.